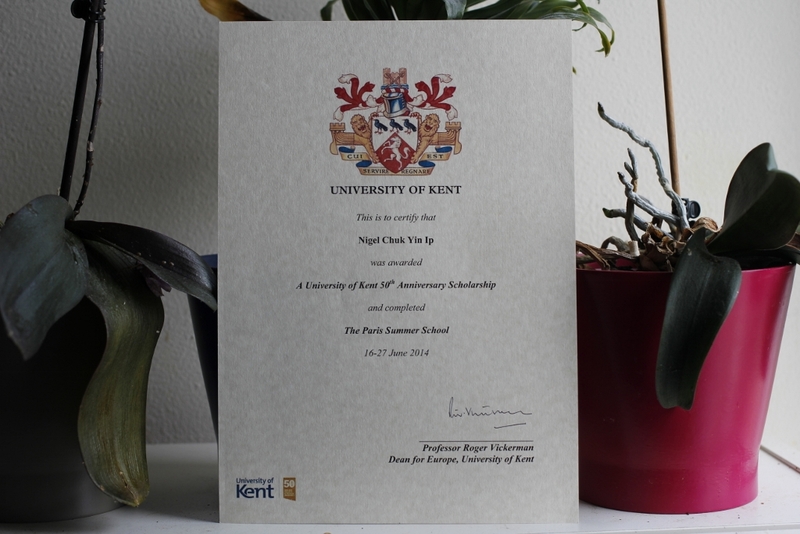 At the beginning of 2014, I was fortunate enough to have been awarded a place on the University of Kent’s Paris Summer School Scholarship scheme for the period 15-28 June 2014. The Paris Summer School is focused on the theme of ‘Revolutions’. This allows students to explore how French culture has long been at the centre of innovation in the fields of architecture, film, literature, art, philosophy and drama. Students will spend two weeks in Paris in an interdisciplinary environment, attending seminars given by academics from the University of Kent and visiting important sites and museums related to the programme. This will give students an experience of living and studying in one of Europe’s major capital cities and provide an insight into a wide variety of subject areas. Students will gain expertise, skills and intercultural awareness which will be attractive to potential employers. In light of this opportunity I intended to produce daily content during this two-week period about my experience in the ‘City of Light’. These posts consisted of discussion topics and highlights from my everyday activities during my time in lectures and seminars. I also intended to write about my adventures as I explored the city in the best way I knew how – walking (second only to eating) – as a flâneur in 21st-century Paris. These took the form of thoughts and ideas that sprang to mind as I perused the streets of the city and the banks of the river Seine. I also wrote mini exhibition reviews as I endeavoured to take in as much of its culture, history and ever-growing art scene in this short period of time. With the Louvre’s unveiling of its new collection for its Abu Dhabi branch in its Birth of a Museum exhibition and a major I, Augustus, Emperor of Rome exhibition touring from Rome to the Grand Palais celebrating the 2000th anniversary of the emperor’s death, the timing of this opportunity could not have been better handled. Unfortunately, this series of posts abruptly ended at the one week mark, due to much difficulty condensing all of the incredible insights I had experienced into writing, let alone as a daily series. Nevertheless, I hope you readers will enjoy reading about it.